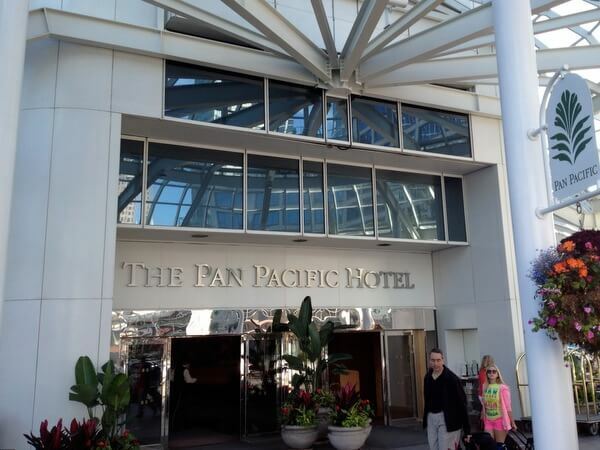 I’ve never been on a cruise, but I did the next best thing: I stayed at the Pan Pacific Hotel Vancouver. Located on the waterfront in downtown Vancouver’s Canada Place, known for its landmark soaring white sails, the Pan Pacific actually looks like a cruise ship. 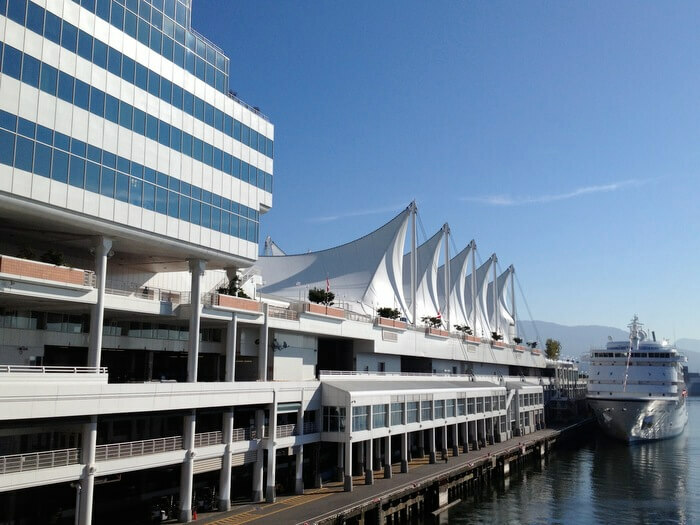 Built in 1986, the deluxe 23-story lodging shares its building with the east wing of the Vancouver Convention Centre and with the city’s cruise ship terminal. Particularly during peak cruise season from May through September, the hotel is busy with cruise vacationers at the start or end of their trips (most cruises from Vancouver head north to Alaska). 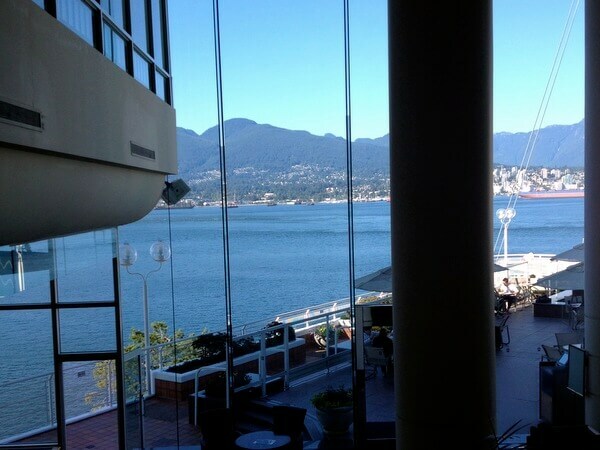 You feel almost like you’re on a cruise ship when you wander through the lobby, where a wall of windows overlooks the Burrard Inlet and the North Shore Mountains. My daughter (who joined me for my stay) and I had our dinner out on the Patio Terrace, enjoying a salad of greens, proscuitto, and summer peaches and a plate of fish ‘n’ chips as we watched the float planes buzz past. Even though we live in Vancouver, we couldn’t stop admiring the view. The Pan Pacific’s 503 modern guest rooms have a nautical theme as well. The crisp white bedding is outlined with shipshape navy piping, with furnishings done in cruise-ship-style honey-hued wood. You can request your preferred pillow type from the hotel’s pillow menu. Many of the units, particularly those facing north or west, have those spectacular water and mountain views. 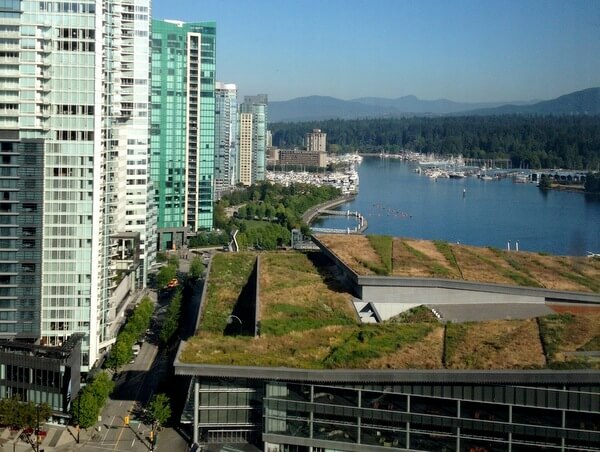 Ours looked toward Stanley Park, over the green roof of the Vancouver Convention Centre’s west building. 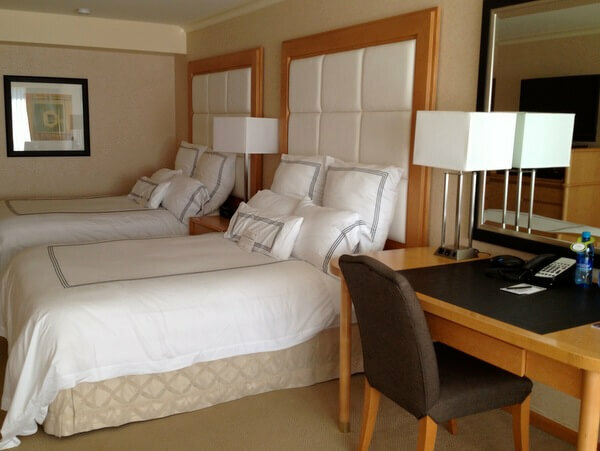 Until a cruise ship’s cabins, though, the rooms at the Pan Pacific Vancouver give you plenty of space to spread out. With their large windows, even the smallest accommodations, which measure 350 square feet (33 square meters) feel big and airy. 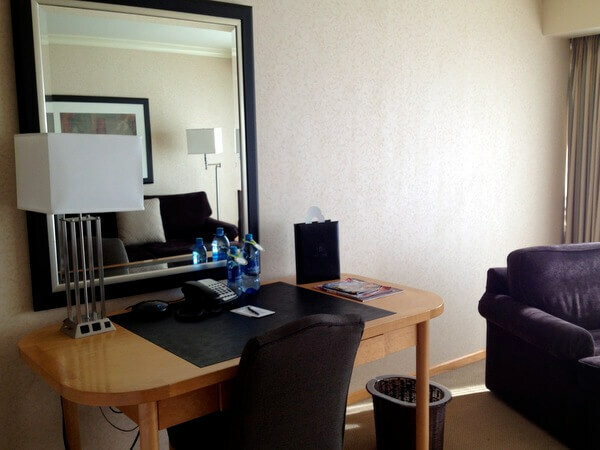 Our room had two double beds with adjacent reading lights and electrical outlets, a good-sized work desk, and both a velvet upholstered sofa and a matching armchair. Other room amenities include a coffeemaker, safe, iPod dock/clock-radio, a 42-inch flat-screen TV, and fluffy terrycloth bathrobes. 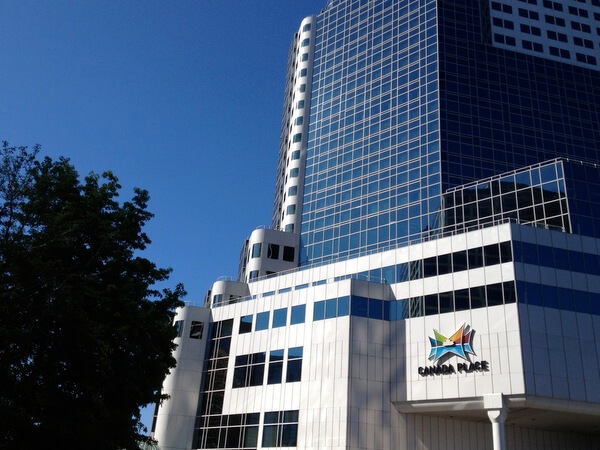 As on a cruise ship, there’s plenty to do at the Pan Pacific Vancouver. 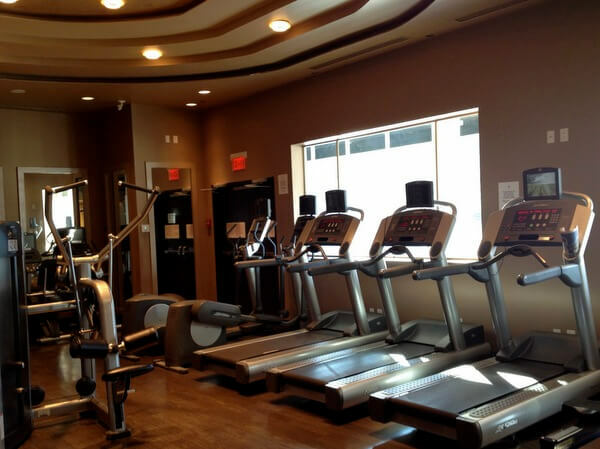 Though the fitness room is a little tricky to find — you have to walk through the parking garage to the entrance, on the cruise ship level beneath the hotel — it’s large, modern, and well-equipped, with views out toward the mountain. Even nicer is the heated pool, hot tub, and sundeck on the building’s eighth floor, where you can enjoy the mountain backdrop and views of the nearby downtown towers as you swim or soak. In addition to the Patio Terrace, where you can have drinks and light meals, the Pan Pacific Vancouver has several dining outlets. The main dining room is Oceans 999, which serves breakfast, lunch, and dinner. It’s known for its lavish Sunday brunches and for its long-running Saturday evening “Opera Buffet,” where singers entertain as you dig into an Italian dinner. The Coal Harbour Bar also serves beverages and an all-day menu, from noon until midnight (1am on Fridays and Saturdays). On weekend nights, there’s usually live jazz. 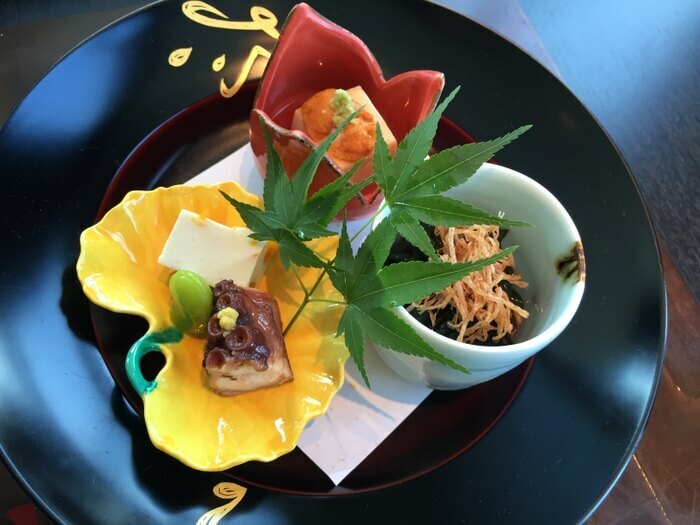 Located in the hotel but under separate management is Five Sails, a high-end wining and dining spot overlooking Burrard Inlet. Double room rates at the Pan Pacific Hotel Vancouver start at about CAD$250/night, with peak summer rates in the $500-700/night range. You can compare rates at Priceline or Hotelopia. If you bring your car, you can park in the large underground garage beneath the hotel. Self-parking is CAD$42/night, and valet service is $47. Because the hotel is centrally located in downtown Vancouver, within walking distance of the commercial areas, visitor attractions, and numerous restaurant, most guests don’t need a car during their stay. Some day, I hope I’ll have the chance to take a cruise. But in the meantime, there’s the Pan Pacific Hotel Vancouver — whether you’re starting or ending your own cruise at Canada Place, or simply looking for a suitably nautical place to stay on the waterfront in beautiful British Columbia.